3. Why are there no automatic updates on themes in Shopify? How do I change the homepage? 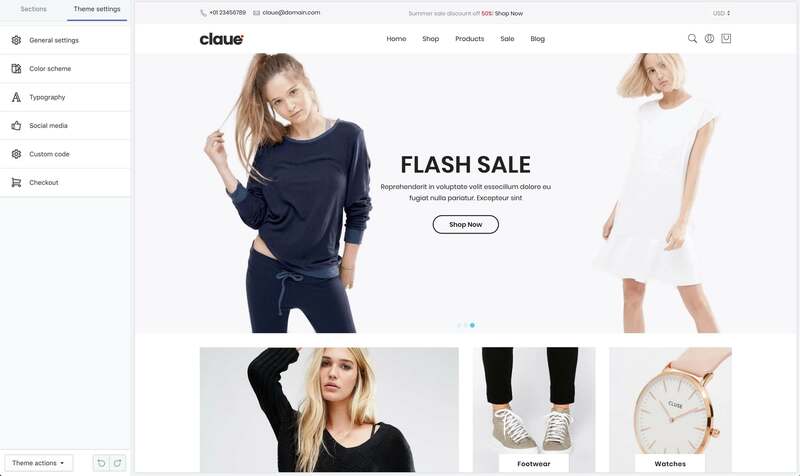 Claue is a feature packed Premium Shopify theme for Shopify with a modern design, minimal feel, bundled with powerful plugins for creating versatile online stores. 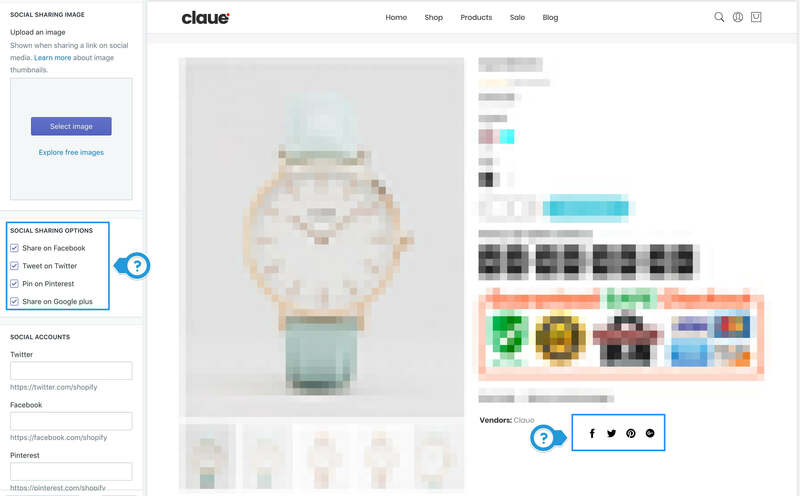 After many months design and development raking over every detail of what a modern online retailer needs, Claue is ready to take your online empire to the next level. With clever integration of social networks like Instagram for building traffic and clickable links, to it's incredibly fluid responsive design for all of today's modern devices and much more, we know you are going to love Claue. After the payment on Themeforest is complete, there will be a download link which you can follow to download the theme's ZIP file. An email will also be sent containing this download link. After the theme has been downloaded, Unzip the package you will see the theme package. Remember that don't upload the package dowloaded from Themforest. After that, log in to your Shopify Admin and go to Online Store > Themes. Upload the entire ZIP file and then publish it as your 'Main' theme when the theme is ready to be published (note that it will also be used on mobile devices). We frequently update our themes to include new options, support for new Shopify features, improvements and bug fixes. In most cases, if you have edited your theme files, added any Shopify Apps or made any custom changes you will need to manually update the theme to the latest version. When you manually add an updated version of a theme, a second version of the theme is added to your online store. The new version is in its default state, with none of your customizations applied. The older version is unaffected by the update, and still has all of your code customizations. Create a backup copy of your existing theme. Duplicate the current version of the theme on your store. Right click on customise on the copy of the current theme and click open in a new window. Right click also on the updated theme and click open in a new window. Go to Changelog Section and look at the various files changes were made to. Copy the file from your copy of your current theme to the original text section at Diffchecker. Copy the same file also from the Updated theme and paste it into the changed text at Diffchecker. Scroll Down On Diffchecker and click find differences. The changes made would then be highlighted in green for you to copy and then paste in your copy of your current theme. Repeat 6-8 until you have made changes to all the files on changelog, save and publish your copy of your current theme. Remember to always preview after each change to make sure you have it right. To view this area, From your Shopify admin, go to Online Store > Themes > Customize > Theme Settings. The settings here will applies styling and layout for whole store. Content width 1170 Setting width for content, this setting apply for whole layout of your store, the value defined in pixels, don't add the unit. Secondary #222222 This color applies for the secondary button background, links. Claue theme come with the variety of google fonts to choose from, already “built-in” and ready to use! Body font weight 400 Font weight of body text, If you choose google font you need to check the font weight available here, See How to check? To offer multiple currencies on your online store, you must first edit your store's currency formatting. From your Shopify admin, go to Settings. In each text field, copy and paste <span class=money> in front of the formatting text. Do not put quotation marks around the word money in the span tags. Adding quotes will break the code. In each text field, copy and paste </span> after the formatting text. You might notice that by default the original HTML without currency field does not include a currency descriptor, such as USD or CAD. For this tutorial, we recommend that you do add the descriptor, to avoid any confusion between currencies later. Place the span tags in the HTML with currency and HTML without currency text fields only. Do not place the tags in the Email with currency or Email without currency text fields. Shown when sharing a link on social media. Learn more about image thumbnails. To change the Theme Style, you'll need to login to your Shopify admin, then go to Sales Channels > Online Store > Themes. Once you are there, click on Action > Edit code, this will bring up your theme editor. Open file settings_data.json inside Config folder. Remove the content in this file and copy the content of the homepage file which you want to use in Home folder of download package into this. 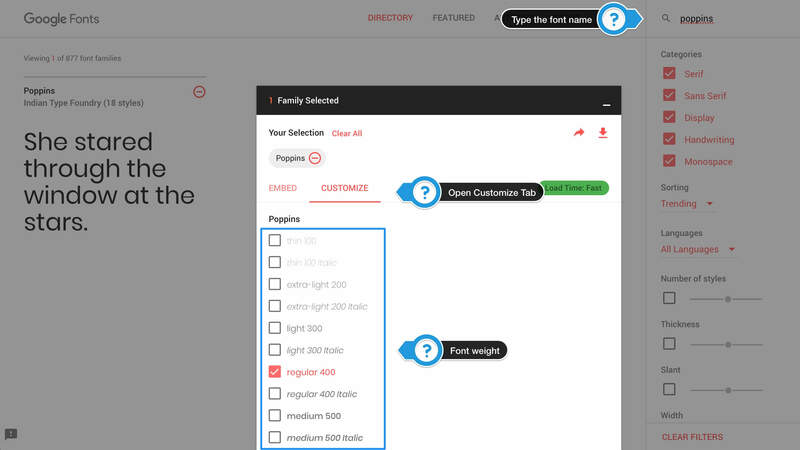 Claue includes 11 dynamic sections to help you building a stunning homepage. To add section to Your home page, you'll need to login to your Shopify admin, then go to Sales Channels > Online Store > Themes > Customize. Full width section Uncheck Make the section full width. By default, the width of section is 1170px. Choose blog Empty Choose blog which you want to show the post. This is required parameter. Posts 3 Choose the number of post which you want to show. Show author Checked Show post author. Show date Checked Show publish post time. Collection per row 4 Choose the number of collection which you want to show. Content Empty Choose the collection which you want to show. Maximum of 12. Image Empty Choose the image. Background overlay #000 A mask overlay image to make your text easier to read. The first text size Empty Size of the first text. the value defined in pixels, don't add the unit. The second text size Empty Size of the second text. the value defined in pixels, don't add the unit. The third text size Empty Size of the third text. the value defined in pixels, don't add the unit. Make the third text as button? Uncheck If you checked this option, the third text will displays as a button. Link to Empty The link when click on the button. Gutter width 0px The clear empty space between element. Content Empty The content of section. Item per row 3 Choose the number of item which you want to show. Content Empty The content of section. Maximum of 20. Full width section Checked Make the section full width. Limit 8 The number of image which you want to show. Image size 320x320 Which takes values between 150x150 and 640x640. This is size of Instagram, you can't add the custom size. Gutter width 0 The clear empty space between element. Content Empty The content of section. Maximum of 4. Section height 350 Height of section, the value defined in pixels, don't add the unit. Content Empty Choose the collection which you want to show. Product per row 3 Choose the number of product which you want to show. -Logo width: The recommended size is maximum of 150px. The value defined in pixels, don't add the unit. Content - Add the content in footer column. Maximum of 5. Fix: Variant images of variant product does not display. Fix: Google captcha does not work when enable HTML minify. Fix: Missing content on account page. Fix: Contact form can't send the message. Fix: Broken layout of Blog section. Improve: Live search style and layout on search result page. Fix: Style of subscribe form was broken on Firefox browser. Fix: Product related layout was broken. Fix: A bug related to countdown timer in product detail. Improve: Add CSS body class for collection, product to easier customize those pages. Improve: Display as slider on mobile for Blog section. New feature: Add option to change product variant when change product thumbnail. New feature: Add option to disable slick slider when change product variant. Fix: Can't upload the logo in theme customize. Improve: Add option to enable/disable HTML minify feature. Improve: Add option to show/hide product description and review tab. Fix: Cart count in Header does not work for the first adding item in the cart. Improve: The font picker in theme customize. Improve: Add option to change color swatch style. Improve: Minify HTML code in the theme to improve the theme performance. Fix: Product image thumbnail does not show on mobile in vertical slide. Fix: Can't choose the product variant when one of them is sold out. Fix: Currency switcher does not work. Improve: Remove the Add to cart button on product list when the product is sold out. Improve: Hide countdown timer in product detail when the countdown ends. New feature: Add settings to control product image size. Fix: Color swatch is not display well. Improve: Minify JS file to improve the performance. Fix: The currency swicher does not work. New feature: Mailchimp newsletter popup. New feature: Add a option to config mobile layout.